It is made of gold with diamonds, rubies, emeralds, sapphires, enamel and pearls. Its height and diameter are both 18 centimetres (7.1 in). The crown has been a property of the House of Wittelsbach since 1402, when it came with Princess Blanche of England, daughter of King Henry IV of England, on her marriage to Louis III, Elector Palatine. After the junior Bavarian branch of the house became extinct in the male line in 1777, the senior Palatinian branch replaced the former as the country's rulers. 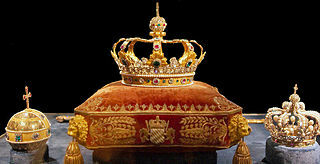 Today, the crown is displayed in the treasury of the Munich Residenz, where it has been kept since 1782. It has been described as "one of the finest achievements of the Gothic goldsmith". The crown is made up of 12 hexagonal rosettes on the base each supporting a gold stem topped by a lily. The stems and lilies alternate in size and height. They are heavily jewelled versions of the fleur de lys (lily flower) that was popular for medieval crowns. In the middle of the hexagons, which have enamelled white flowers overlaid onto a translucent blue or red background, is a pale blue sapphire, 11 of which are oval and 1 is hexagonal. Each point is decorated with alternating rubies and clusters of four pearls that have a small diamond at the centre. In addition to diamonds, pearls, and sapphires, the lilies are also decorated with emeralds. Some of the original pearls may have been replaced when the crown was restored in 1925. The lily stems are detachable, and it is possible to fold the crown's base so that it can be transported more easily. Each rosette is numbered 1–12 to make sure the lilies are re-attached correctly. 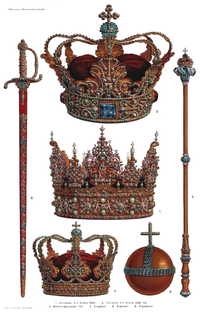 The crown is 18 centimetres (7.1 in) in both height and diameter. The nuptial crown is first documented in the inventory of King Richard II of England as having 12 fleurons, but a rosette was missing. At the time, it was decorated with 91 pearls, 63 balas rubies, 47 sapphires, 33 diamonds, and 5 emeralds. An additional 7 pearls and 1 emerald had been taken off the fleurons. The crown weighed 5 marks 7 oz, or just under 1 kilogram, and was valued at £246 13s 4d. It was recorded again in a 1399 list of royal jewels being moved across London which had been owned by the deposed Richard II and others. Therefore, the crown had most likely belonged to Queen Anne of Bohemia, the wife of Richard II, who she married in 1382. It may have been produced in Bohemia, but elements such as beading on the stems suggest Paris, though the maker might have been a French or French-trained goldsmith working in Prague. Venice has also been suggested as the crown's place of origin. The crown came to the Palatinian line of the House of Wittelsbach as dowry of Blanche of England, daughter of King Henry IV of England. After his accession to the English throne, Henry wanted to make important alliances in order to maintain and legitimize his rule. One ally whose support he hoped to gain was the Wittelsbach King Rupert of Germany, who also took the German throne after the deposition of King Wenceslaus. A marriage between Rupert's eldest surviving son, Louis, and Henry IV's eldest daughter, Blanche, was soon arranged. On 7 March 1401, the marriage contract was signed in London, and the bride's dowry was fixed at 40,000 nobles. In 1402, prior to the wedding of Blanche and Louis III, it was restored by a London goldsmith, who added a twelfth rosette and replaced the missing emerald and pearls on the fleurons. The new rosette contained 12 pearls, 3 diamonds, 3 balas rubies, and 1 sapphire. In total, 1 6⁄8 ounces (50 g) of gold were added to the crown. Blanche wore the crown at her wedding, which took place on 6 July 1402 at Cologne Cathedral in Germany. In 1421, it was pawned to Maulbronn Monastery, and by that time several gems and pearls had been taken out. In 1988, the crown featured in the Age of Chivalry exhibition at the Royal Academy of Arts in London – the first time it had returned to England since 1401. ^ a b Cherry (1987), p. 203. ^ Cherry (1987), p. 202. ^ Cherry (1987), pp. 202–203. ^ a b Gray, pp. 431–432. ^ "Crown of an English queen". Bavarian Palace Department. Retrieved 27 December 2017. ^ a b Institute of Historical Research; Royal Holloway. "Crowns in the treasure of Richard II". University of London. Retrieved 28 December 2017. ^ Cherry (2011), p. 61. Cherry, John (1987). Alexander, Jonathan; Binski, Paul (eds.). Age of Chivalry: Art in Plantagenet England, 1200–1400. Royal Academy of Arts/Weidenfeld & Nicolson. ISBN 978-0-297-79182-9. Cherry, John (2011). Medieval Goldsmiths (2 ed.). British Museum Press. ISBN 978-0-7141-2823-8. Gray, Amanda (1989). "A Fourteenth Century Crown". Journal of Gemmology. 21 (7): 431–432. ISSN 0022-1252. Harlow, George E. (1998). The Nature of Diamonds. Cambridge University Press. ISBN 978-0-521-62935-5. Stratford, Jenny (2012). Richard II and the English Royal Treasure. Boydell Press. ISBN 978-1-84383-378-9. Harper, Elizabeth (2010). "Pearl in the Context and Fourteenth-Century Gift Economies". The Chaucer Review. 44 (4): 451–439. doi:10.1353/cr.0.0044. The Bouquet of Lilies Clock egg is a jewelled Easter egg made under the supervision of the Russian jeweller Peter Carl Fabergé in 1899 for Tsar Nicholas II as an Easter gift to his wife, the Tsaritsa Alexandra Fyodorovna. It is currently held in the Kremlin Armoury Museum in Moscow, and it is one of the few Fabergé eggs that have never left Russia. Navaratna is a Sanskrit compound word meaning "nine gems". Jewellery created in this style has important cultural significance in Indian religions of Hinduism, Jainism and Buddhism. The Dunstable Swan Jewel is a gold and enamel brooch in the form of a swan made in England or France in about 1400 and now in the British Museum, where it is on display in Room 40. It was excavated in 1965 on the site of Dunstable Friary, and is presumed to have been intended as a livery badge given by an important figure to his supporters; the most likely candidate is probably the future Henry V of England, who was Prince of Wales from 1399.